We’ve attended the festival in past years (2012 and again last year), and I have to say that this tremendous undertaking by Ritz-Carlton’s Cultural Advisor Clifford Nae‘ole and the entire hotel is amazing. This is a unique opportunity to experience authentic Hawaiian culture and take part (or simply listen in) on discussions that you otherwise would not find yourself exposed to. Here are a few highlights from the weekend-long festival schedule, with our two cents added. Be sure to check the website for the complete run-down of events, venues and times. The Legend of Ko‘olau – Maui writer Gary Kubota brings his much heralded true-life story of a Hawaiian native, Ko‘olau, to the shores of Kapalua. This one man play, featuring actor Moronai Kanekoa, tells of the plight of Ko‘olau as he refused to be separated from his family, despite his illness with Hansen’s Disease. Sugar + Shake Two Cents: I have had the privilege of working on two memoirs from Kalaupapa patients Henry Nalaielua and Makia Malo, and the immense strength of character that the two men displayed throughout their lives made me feel very awed and humbled. Kalaupapa is the isolated peninsula on Moloka‘i where more than 8,000 individuals with Hansen’s disease (then called leprosy) were exiled. Such was the stigma of Hansen’s disease that families who had a relative with the disease didn’t speak of it. Patients, too, were reluctant to tell their stories. Because of their life experiences, most chose to remain at Kalaupapa, even after the discovery of the drugs that made isolation unnecessary, rather than returning to the families and society that had rejected them. “E Ala E” – Traditional ceremonies to awaken the sun and rejuvenate the spirit. Swimwear recommended. Shuttles available starting at 5:30am in the lobby if needed, or walk to beach on own. Sugar + Shake Two Cents: This is a very spiritual experience and a good way to put you in the cleansing and open frame of mind appropriate for the weekend’s events. If you go, you should be prepared to participate 100%—it is about being in the moment and experiencing it fully. 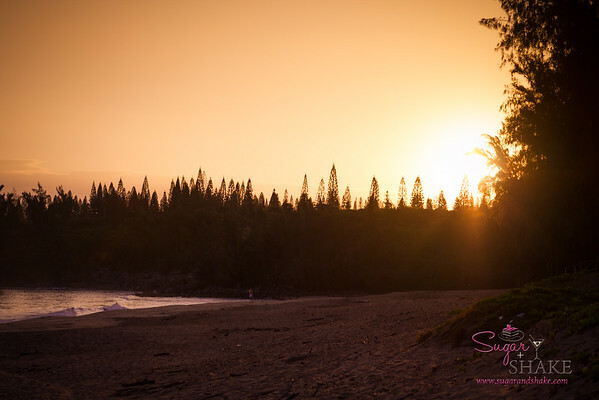 You are not required to enter the water for the hi‘uwai (water purification) but you should at least touch your feet to the water to acknowledge the spirit of cleansing. (It is pretty cold, so no one’s faulted for not wanting to completely immerse oneself.) Photography is not permitted during the ceremony; I took this shot of the sun rising above the treeline after the ceremony completed, but I’ll be honest—there’s nothing particularly special about it. You can’t capture the feeling you get from participating through a viewfinder. I would leave the camera behind. “Ka Wai a Kāne…The Waters of Kāne” – Practitioners and event participants commit to another year of supporting the culture by consuming ‘awa, “the bitter waters of Kāne.” Photography is permitted prior to the blowing of the conch shell while the awa bowl is covered and after the final conch shell sounds and the bowl is recovered. Photography is not permitted during the ceremony or while the awa bowl is uncovered. 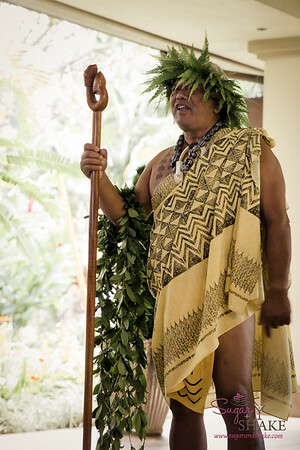 “Wehe ka Ipuka…Open the Doorway” – Traditional chants and protocol officially open the 23rd Annual Celebration of the Arts. Two deserving kūpuna (elders) will receive the Namahana Award of Excellence in honor of their support of all things Hawaiian. Sugar + Shake Two Cents: It’s difficult to get a good vantage point for this ceremony, as it takes place in the doorway of the hotel. ‘Ohana groups approach the door to offer a chant or invocation before entering. This is one facet of the event that I think could use more explanation for guests because there isn’t one at all beyond the brief description of it as a welcoming and opening ceremony. The participants aren’t identified, although they are obviously those whose families are involved with the event. On the whole, you’re left with a sense of respect, but not too much understanding. “Imagine… Steering (Y)our Own Canoe” – Native Hawaiians with decision making positions focus on the future by encouraging the youth of today to step forward and steer their own path to success. Panelists: Trustee Hula Lindsey – Office of Hawaiian Affairs, Maile Meyer – Owner of Na Mea Hawai‘i, Native Books & Hawaiian Things, Kumu Kapono‘ai Molitau – Kumu Hula & owner of Native Intelligence Co., Kawika Frietas – General Manager of the Old Lahaina Lū‘au. “Imagine…Flowering Waters, Healthy Lands and Streams” – The film Ola i ka Wai…Water is Life is shown focusing upon the right to have water for traditional agriculturists and Native Hawaiian fresh water species. From the heavens to the mountain…from the mountain to the stream…from the stream to the ocean…everything is connected. Kyle Nakanelua from the taro patches of East Maui…Hokuao Pellegrino from the patches of Wailuku…and Calvin Hoe from the patches of Waiahole Valley on Oahu share their concerns, victories…and struggles. Funded by the Office of Hawaiian Affairs and produced by 4 Miles, LLC. “Imagine… The United Nations of Polynesia” – “Most people live on a sea of land…we…live on a continent of water,” says elder Sam Ka‘ai. How should we as island nations unify to protect the resources of our continent, the greater Pacific? What plans do we implement to create businesses, better health care, education, and the protection of our cultures? Panelists: Mawae Morton – New Zealand General Counsel; Dr. Failautusi Avegalio – University of Hawai‘i, School of Business; Tricia Allen – Lecturer, Hawaiian and Pacific Studies Windward Community College; Ramsay Taum – Kumu, Life Enhancement Institute of the Pacific. “The Celebration Lū’au and Show” – A lū‘au of traditional & contemporary food combined with stellar talent to take you back to the days of nostalgic Hawai‘i. Entertainment includes the voices of Ahumanu followed by the award winning voice of Kumu Carson Kamaka Kukona and Halau Hula O Ka Hanu Lehua as they perform ancient and contemporary styles of hula. Topping it off will be Eric Gilliom and his band as he rejuvenates the songs of his CD Into the Mystic, dedicated to the newly launched Maui voyaging canoe Mo‘okiha, and Hawai‘i’s mothership of voyaging canoes the Hōkūle‘a as she attempts to circumnavigate the globe. Tickets: Premium Seating (limited) — $125 per adult / $60 per child (5 – 12 years); General Admission — $100 per adult / $50 per child (5 – 12 years). Sugar + Shake Two Cents: If you’re going to go to one lū‘au your whole life, make it this one. I’ll meet you by the ‘ōpae and ‘opihi. Clifford pulls out all the stops and works his contacts to bring in the best food and entertainment. This is just a short sampling of the events that will be going on. As I said, be sure to check out the full schedule on the festival’s website. There are other presentations, hands-on activities and ongoing daily and nightly entertainment. Disclosure: We were invited to attend Celebration of the Arts as guests of the Ritz-Carlton Kapalua and the Maui Visitors Bureau. Travel and accommodations were provided by the hosts, but no financial compensation was received for this post and no representative from the establishment/event was given the opportunity to review or comment upon this post prior to publication.